Finger lickin' fried chicken wings. 1. A day before, in a large bowl, combine the marinade ingredients. Add the chicken wings, coat well in marinade, cover and keep in the fridge for a day. 2. To make the hot sauce, place a large pot on high heat, add the oil, chillies, garlic and ginger and fry until the garlic is soft. 3. Add the brown sugar and cook for about 10 minutes until it caramelises and the mixture resembles jam. Add the water, bring to the boil and simmer until the chillies are very soft, 10-15 minutes. 4. Transfer the mix to a food processor and mix until smooth. Add the vinegar and season with salt; it will need quite a lot. If the sauce is too thick, add a little more water – it should be quite thin. 5. Pour the hot sauce into sterilised jars and store in the fridge. The sauce will last at least a year. 6. 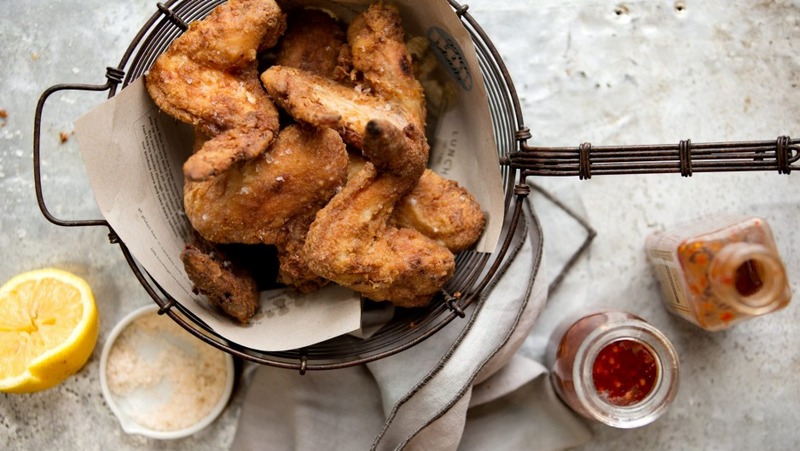 When you're ready to cook the wings, combine the frying flour ingredients in a large stainless steel mixing bowl. 7. Put the vegetable oil in a large pot and heat on high. If you have a thermometer, monitor the oil until it reaches 180C. If you don't have a thermometer, dip the handle of a wooden spoon in the oil. Small bubbles will come off it if the oil is hot enough. 8. When the oil is ready, remove the wings from the marinade and toss in the frying flour, making sure they are well covered. Using tongs, lower the wings carefully into the hot oil so it doesn't splatter – the oil will burn if it makes contact with skin. Cook the chicken wings, four or five at a time, for six minutes, then remove with tongs and put onto paper towel to soak up the excess oil. Serve the wings with hot sauce.